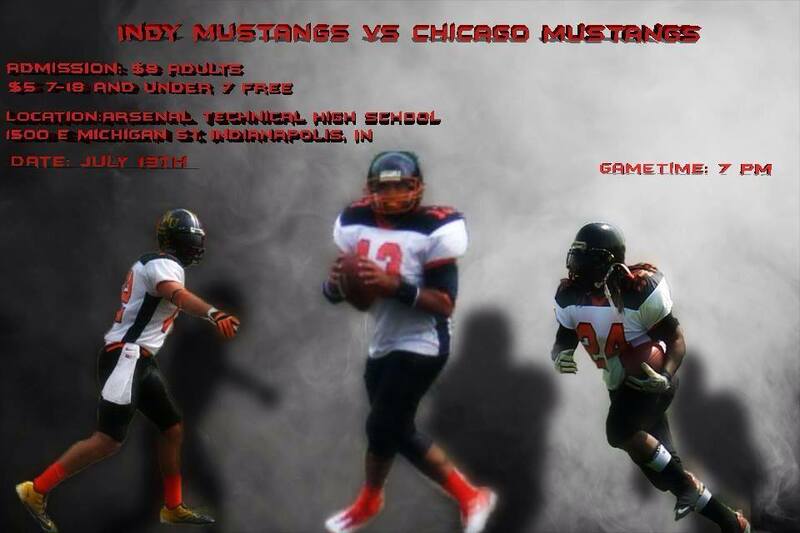 In the opening week of league play for the Mid States Football League (MSFL), the Indiana Mustangs will host the Chicago Mustangs on Saturday, July 13th at the beautifully-renovated, Arsenal Technical High School. Tech’s football stadium features a new turf field that was donated by the NFL following the 2012 Super Bowl. Gates open at 6 PM and kickoff is scheduled for 7 PM. This year represents the Indiana Mustangs 23rd season, earning the team the distinction as the oldest and most successful semi-pro football in Indiana. Indiana will be looking to avenge last year’s loss to Chicago even though both teams made the MSFL playoffs last year. Both teams are members of the prestigious Mid States Football League (MSFL) which will feature twenty of the top semi-pro teams in the Midwest covering Indiana, Illinois and Wisconsin. The Chicago Mustangs will feature former Illini quarterback, Juice Williams at the helm of the offense. Williams recently wrapped up his second season with the Chicago Slaughter of the professional Indoor Football League. The Slaughter roster also included two Indiana players in Jerimy Finch (Warren Central HS and Marian) and Madison Miller (Arlington HS and Indiana State). The Indiana Mustangs will be led offensively by standout quarterback Eric Hooks (North Central HS and St. Francis) , and he will have a host of talented receivers to choose from including one of the league’s top receivers last year Gavin Wisel (Trine U. ), Jeff McClure (Brownsburg HS, Marian U. ), Paul Carter (Northwest HS and St. Francis), James Sharp (Arlington HS) and speedy newcomer Jasper Johnson (Ben Davis HS). Defensively the Mustangs will be led by former Buffalo Bill player Madison Miller, Jerimy Finch, three former Hoosiers – Stefan Osby, Darius Johnson and Freddy Jones and former Marian All Conference players Dontae Crooks (Arsenal Tech), Jovan McCray and Wm Stubbs (Cathedral HS) along side two MSFL All Conference defensive ends, Michael Cupp (Danville HS) and Eric McKinney (Washington HS).